MonoSoho ran a Vanilla Minecraft server starting back in November 2010 on Alpha Minecraft 1.1.2. After all the changes to Minecraft over the years, a certain amount of nostalgia for the old days has appeared. And so, after digging up the source code for a few of the old server mods, MonoSoho presents an Alpha 1.2.6 server. Note that this is a whitelisted server. Contact Monotonehell via one of the socials in the menu above (Twitch, Twitter, Steam) and ask to be whitelisted before you attempt to join the server. 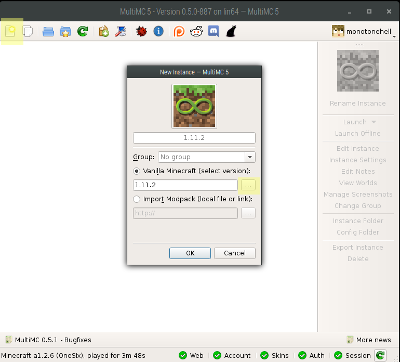 MultiMC is an open source Minecraft Launcher, which has many features, like managing multiple instances of Minecraft all to be installed at once with their own versions and configs. You can download and install MultiMC Launcher from their website. 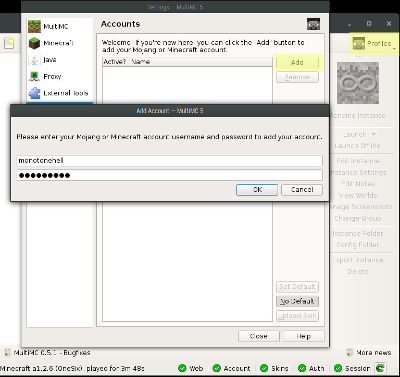 Once you have it installed and running, you need to add your Minecraft/Mojang account to the Launcher. Click the Profiles button in the top right and go to manage accounts. Click add account in the manage accounts window. Enter your real Minecraft player name and password here. MultiMC will ask Mojang if you're a paid up user and add your account if you are. Close the account manager and click on new instance in the top left corner. 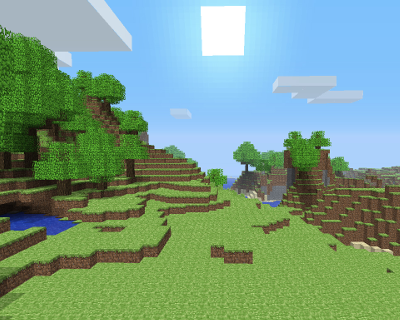 Find the select vanilla Minecraft field and click the elipse [...] button. From the list scroll down to the alpha section and chose "a1.2.6". Click okay and let MultiMC download what it needs to. Click once on the a1.2.6 icon and then on the "play offline" button. 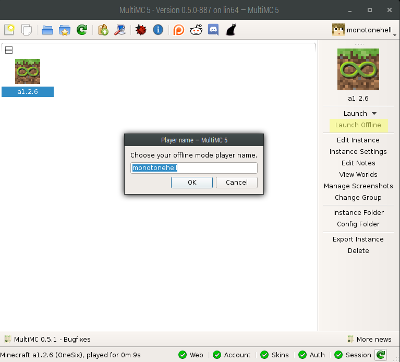 Let MultiMC download what it needs to and then when asked "Choose your offline mode player name" enter the name you asked to be whitelisted as. If you did the above all corectly you should be standing at spawn. However, you wont be able to move until you register a passcode. Where <passcode> is a short passcode you will remember for when you log in in the future. Where <passcode> is the short passcode you entered at the register command. Remember to use the exact same offline player name and passcode each time or you will be kicked.